Trust Provision - IEEE Foundation, Inc.
A provision in a will or living trust is the most common way to a make planned gift to the IEEE Foundation. There are different kinds of bequests to choose from depending on your financial objectives. Specific bequest. Designate a dollar amount or percentage to the IEEE Foundation (or a specific IEEE Organizational Unit, program, or project). Residuary bequest. After all other specific bequests, debts, taxes, and expenses have been paid, designate the IEEE Foundation to receive all or a stated percentage of the "rest, residue, and remainder" of your estate. Contingent bequest. Request that the IEEE Foundation receive all or a part of your estate, if certain circumstances were to occur, such as all other named beneficiaries pre-decease you. When deciding how to structure your bequest, it is important to consider how you would like your gift to benefit the IEEE Foundation. "I give the sum of $______ [or all (or stated percentage) of the rest, residue, and remainder of my estate] to the IEEE Foundation, Incorporated, a corporation organized under the laws of the State of New York, with business address of 445 Hoes Lane, Piscataway, NJ 08854-4141, USA." "I give the sum of $______ [or all (or stated percentage) of the rest, residue, and remainder of my estate] to the IEEE Foundation, Incorporated, a corporation organized under the laws of the State of New York, with business address of 445 Hoes Lane, Piscataway, NJ 08854-4141, USA to be used for the (name of the IEEE Organizational Unit, program, or project). In the event that such use shall, in the reasonable judgment of the IEEE Foundation's Board of Directors, become impossible, illegal, or impracticable to fulfill, then for such similar purposes as the Board of Directors in their discretion shall determine." "I give the sum of $______ [or all (or stated percentage) of the rest, residue, and remainder of my estate] to the IEEE Foundation, Incorporated, acorporation organized under the laws of the State of New York, with business address of 445 Hoes Lane, Piscataway, NJ 08854, U.S.A. to establish anendowment fund, the principal of which shall be invested as the IEEE Foundation Board of Directors may deem best and the income only used for (if you wish - named program or project). In the event that such use shall, in the reasonable judgment of the IEEE Foundation's Board of Directors, become impossible, illegal or impracticable to fulfill, then for such similar purposes as the Board of Directors in their discretion shall determine." 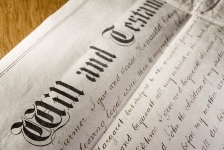 Bequest language can be modified by your attorney to make it consistent with your specifications and the rest of the language in your will/trust. If you decide leave a bequest to the IEEE Foundation in your will or living trust, we hope you will share the good news with us. We can work with you to ensure your wishes can be fulfilled and acknowledge your generosity by inviting you to join IEEE Goldsmith Legacy League, the IEEE Foundation's planned giving recognition group. You may request to remain anonymous.